-The perfect size to fit a laptop and a textbook, along with your wallet, phone, keys and other necessities. The bottom is reinforced with stitching inside and little legs on the outside so this bag can definitely handle heavy loads. -Two very deep pockets with a snap closure on the inside so nothing falls out of these pocket. I put my keys wallets, mints and all other small things in here and they don't fall out. -Stain and smell resistant interior. I'm taking a UC Berkley extension class (yay for continuing education) and on the second day I put a kombucha drink in the bag. By the time I got to class I saw that the pink raspberry kombucha had leaked all over the inside of the bag. If you have ever had kombucha, you know that it stinks! (It's basically fermented tea). So I was worried my tote would smell like kombucha forever, but I just wiped it up and the smell and stains were gone! And it never stained to the outside of the bag. This bag isn't cheap but for the quality, good durable leather, I would say this bag is well worth the price and Everlane delivers on their promise of high-quality goods at decent prices. 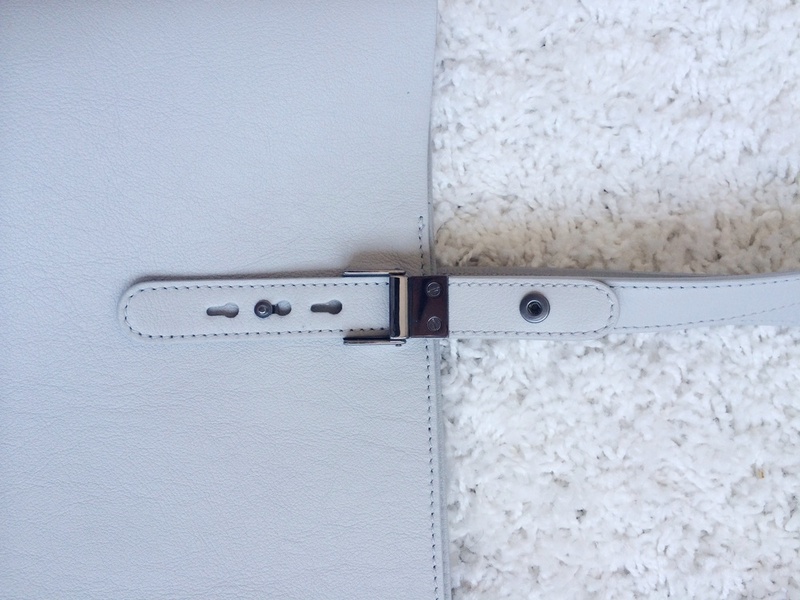 This is probably the best light colored bag I've ever had and it's the perfect cool-toned neutral bag for the summer! You can find the bag here and it comes in bright navy and black. [This is not a sponsored post, though I wish it was. I just wrote this because I really do love this bag!]. Also here's a look at the inside pockets. The front and back sides are covered by another leather layer that the pockets are stitched onto, but the sides are suede (and did you see? No kombucha stains, even on the suede. I think it's because it's not a soft absorbent suede, it's a thicker semi-water repellant suede type material).